Ha! I just made a coast/neutral button! Re: Ha! I just made a coast/neutral button! As for the plugs, it doesn't matter if the male side is PCB only. No big deal. To have a board made up just to have the connector on is but a few pennies. Happens all the time in my industry. Either that or cough up ~$2500 to have molds made. Will have to sell a LOT of coast switches to cover that though. It wasn't the one you circled, but the one on the module itself. And my harness guys may indeed find them aftermarket somewhere. I have gone from heavy regen to N and back many times already with my button. I tried it at WOT, full regen and everywhere in between. So far so good. But it indeed may not be healthy in the long run. My normal driving doesn't have me doing that though. If anything I go from coast to heavy regen and not so much the other way around. The plug itself is discontinued from the original manufacturer. But there are indeed a few kicking around here and there. Now to find the PCB side but with only the plug I need and not all of them. Well, JAE never made the single socket for the 28p. They did make a dual though. For that plug and a 20 pin at the same time though. That's better than 100+ pins. Could probably just cut the 20p off. Found a couple of places that may actually have stock! We will see if they even reply. I spent some time aggressively driving. 137kmh on the speedo. Lol. But I was checking this regen-to-coast concern, and I am not concerned in the slightest. From a max-regen at 75kmh to coast, I felt the transition was extremely smooth and controlled. To me it seems like the car knows what's going on and it is A-ok with it all. I did this many times, from many speeds. Max regen in B mode, then hit the coast switch. Always the same results. And for curiosity's sake, I did the opposite. Coast to WOT. Also felt great. Then tried full regen to full throttle. Kiev - did you switch both pairs of pins? 4 pins total? I'm thinking your problem was not due to your concern. But for me, heavy regen to coast is a non-issue. i drove again today and did not have a problem while shifting either direction, B->N, N->B. with and without max regen. When i had the fault lights, i may have been shifting back and forth numerous times and then accidentally held the shift lever between the gates to cause the EV-ECU to become confused--it then started throwing codes and putting the car in a safe mode. It took me a little while to get used to throwing it forward to hit B from E, and in traffic with redlights i was diddling with the knob instead of putting it in and leaving it in there (that's what she said). A switch would save wear and tear on the shift sensor sliding contacts and avoid the issue of holding the lever between the gates, so press on regardless of my little incident. 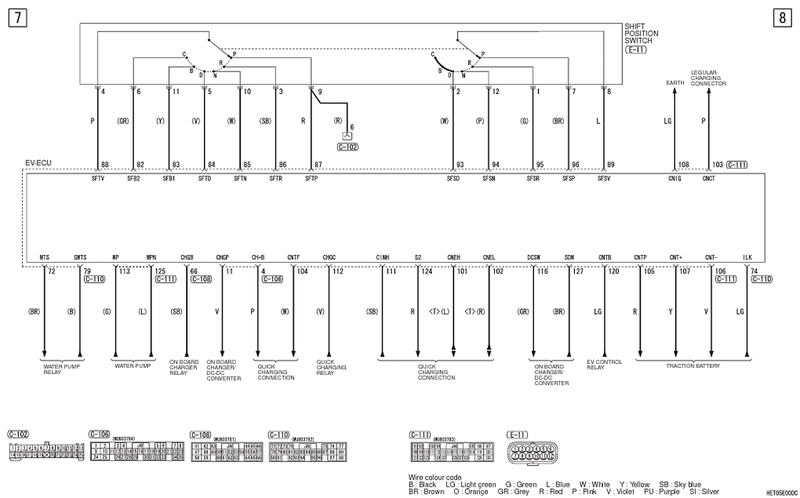 i didn't change the secondary sensor wires since D, E, B are all shown to be connected to the same shift position switch sensor wire to the EV-ECU in the schematic. Yes I agree, I do a lot of shifting from D to N and back (mostly on the freeway) as previously discussed. I just naturally smoothed the transitions with throttle positioning. For instance the car seems to have a good controlled ramp if you shift from N into a driving gear. However if you shift from a drive gear to N it seems to just let go. I instinctively zero the needle with the accelerator before sliding the shifter to neutral. Didn't really think about harming the MCU or not. Just like it smoooth I'm sure it is likely best practice though! As someone who has probably spent more time coasting in Neutral than anyone else on this forum (except maybe Aerowhatt), I've been following this N-button discussion with interest, primarily from the hacking standpoint and wondering if it could form the basis for perhaps a better user interface than our clunky shift lever. The North American shifter layout provides for a gradual decrease in regeneration, with a logical progression going up from B-E-D to Neutral. I do a lot of hilly driving and on downhills (with my foot off the accelerator) I'm constantly modulating my speed using that shift lever, primarily to stay with the flow of traffic. Inasmuch as I try to keep my transitions smooth, I think it would be rare that I would be in B and then would need to instantly jump into N.
The only unexpected response from the car that I've experienced when jumping from N back into one of the other settings has been on long sweeping downhill curves when the road surface gets rough and ASC suddenly kicks the car out regen. Of greater interest to me has always been the possibility of being able to modulate regeneration using some type of paddle or joystick, but I simply have way too many other projects to take the time to pursue this. Been advocating this concept going back to the Aptera, as well as starting with the early days of this forum.